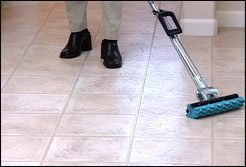 Tile Flooring and Ceramic Tile Floor Cleaning and Maintenance | Classic Carpets Inc. Sooner or later, time and traffic, life and living, will take its toll on any floor covering. Ceramic tile is no exception.But take heart, keeping your tile as clean and beautiful as its first days in your home just takes know-how. In fact, understanding the best methods to care for your ceramic flooring will help maintain its beauty and keep it close to its original condition. Plus, knowing what’s expected of you regarding upkeep can be a determining factor in which type of ceramic tile to purchase. Knowing how to care for and maintain your ceramic floor will help keep your investment beautiful, durable and a source of pride for years to come. 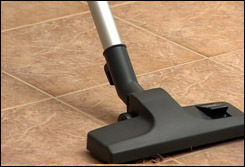 It’s important to sweep a tile floor regularly. Use walk-off mats at all exterior entrances. Remember to shake the mats often to remove the dirt. Textured tiles may require mild scrubbing with a soft brush or electric polisher/scrubber. ble from your local grocery store or flooring retailer for heavier cleaning tasks. 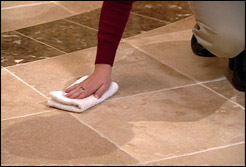 Consult the cleaning product’s instructions to make sure the cleaning product is compatible with your type of tile. Avoid using steel wool, scouring powders, or other abrasives. Don’t use bleach or ammonia based cleaners. Do not clean glazed tile with oil-based cleaners. Try to clean up spills as quickly as possible. Tile can crack under extreme force or pressure. Take the proper precautions when moving heavy objects across your tile floor. Cover furniture and table legs with protectors. Keep extra tiles after the installation. Areas exposed to water need to be caulked on a regular basis. Seal your grout for added protection. Grout colorants are available for stained, damaged or undesired colored grout.